Heard of Ice Cream Sandwiches? 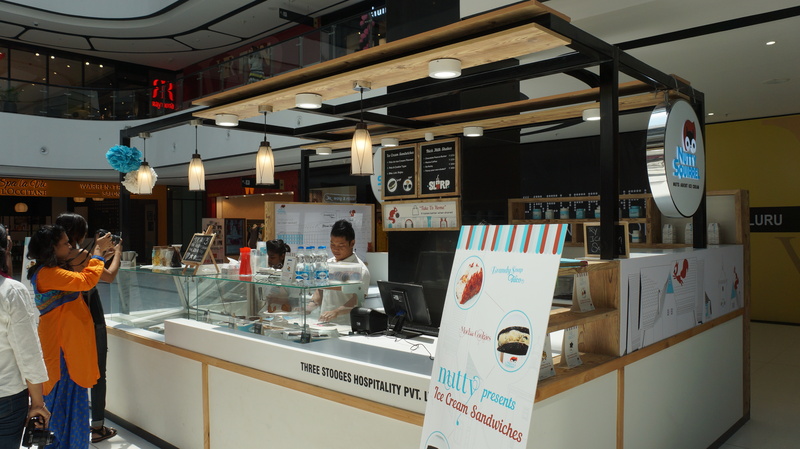 No, then you must visit VR Mall and try out some of the exclusive Ice Cream sandwiches from Nutty Squirrel. The Kiosk located in the Ground Floor at VR Mall, which is a new hot spot in the town. Well, I recently been to VR Mall and explored the Ice Cream Sandwiches and impressed totally. Since I have ordered the Ice Creams based on their recommendation, which totally helped in choosing a right one. Filter Coffee, Pudina, Blueberry and Peanut butter totally caught my attention and best ones as far as I had till date. They use Mocha Cookies, Snicker Doodle and the Brandy Snap Tacos to sandwich the Ice Creams and tastes indeed great. They have Frozen Sandwich and freshly prepared ones. Somehow I wasn’t convinced with the frozen one. Since I found bit hard, but my friendly thoroughly enjoyed it. Post Ice creams, few reviews tempted me to try out their Milk Shakes. Probably those Milk shakes can be consumed only if you skipped your lunch or dinner. Those are flavorful, heavy, refreshing and tasty! There are few tables to sit and enjoy your ice creams right opposite to Kiosk, which is fair! I will advise everyone to visit Nutty Squirrel and honestly, missing these kind of Ice Creams in South Bangalore!